A simplified view of the intervalence interaction is that of a transfer of an electron between two adjacent metal ions. Consider the case of a mineral structure with Fe2+ and Fe3+ in adjacent cation sites. 1) Interactions between ions of a single metallic element in different oxidation states. Fe2+ - Fe3+ interactions are the kind most commonly found in terrestrial minerals. They are a major cause of color in a variety of common and uncomon minerals. The Fe2+ - Fe3+ interaction typically results in absorption of light in the red portion of the spectrum. 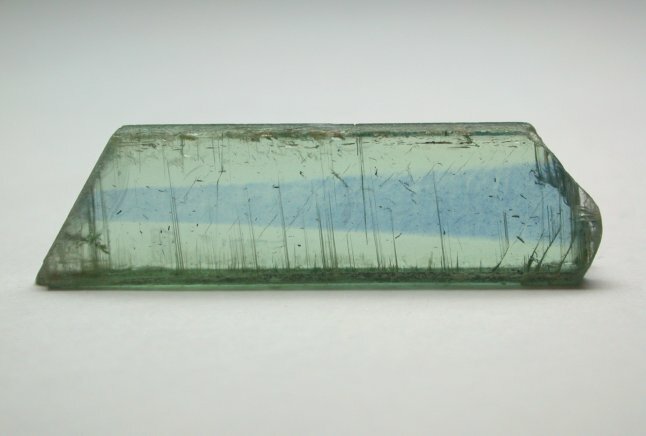 Consequently, most minerals with this interaction are either blue or green when thin. Often, when thick, these minerals appear black. The iron phosphate, rockbridgeite, is an example of a mineral which, by stoichiometry, contains both Fe2+ and Fe3+. 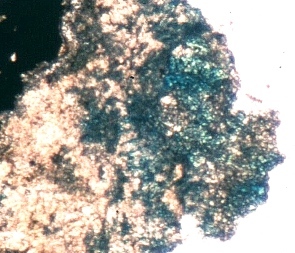 In thin section, the dark green color caused by the IVCT interaction is apparent when the direction of the linerally polarized light is in the direction of the chains of Fe atoms. IVCT interactions are commonly strongly polarized (oriented in the direction of the metal-metal axis). They cause strong pleochroism in minerals. An example is ilvaite. Two orientations of the crystal are shown in linerally polarized light. The dark, intense color is observed when the direction of the polarizer is parallel to the direction in which the electron is transfered between the two metal ions in the crystal. Here is an interesting example of synthetic acmite with sector zonation caused by IVCT. Acmite is pale green color due to Fe3+. In one zone of the monoclinic crystal, there is a minor amount of Fe2+ which generates the The Fe2+ - Fe3+IVCT and causes the much darker green color. Ti3+ - Ti4+ interactions are found in meteoritic minerals. 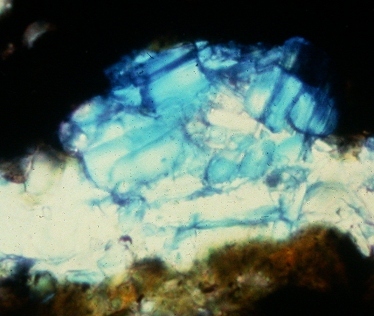 A example of the blue color caused in some minerals by this interaction is the color of the fine-grained, titanium-containing, calcium aluminum oxide mineral, hibonite, in an inclusion known as the Blue Angel in the Murchison metorite. This mineral absorbs red light but lets blue light pass. The optical spectrum of this mineral has a band with a maximum absorption hear 690 nm. Better examples include blue hibonite in the Murray meteorite and the hibonite-bearing inclusions in the Vigarano CV3 chondrite meteorite. 2) Interactions between ions of a different metallic elements. The Fe2+ - Ti4+ interaction is commonly observed in dravite, a member of the tourmaline group, and produces a brown color when present at moderate concentration. In the clinopyroxenes such as the ADOR meteorite (50K) Fe2+ - Ti4+ IVCT produces this brownish-red color. Another example of the Fe-Ti IVCT interaction is found in neptunite which is black when thick, but has a red-orange color in thin sections. In all of these examples, light in the blue end of the spectrum is preferentially absorbed with a resultant emphasis on the yellow, orange and red portions of the spectrum. Fe-Ti IVCT is a common feature of many common minerals such as micas, amphiboles and tourmalines and is often a component of the color of these minerals. Mn2+ - Ti4+ interactions are rarely observed, but have been documented in tourmaline. The band of pale yellow color in elbaite (28K) from Nepal arises from the the Mn2+ - Ti4+ interaction. The light and dark brown zones are from the Fe2+ - Ti4+ interaction. 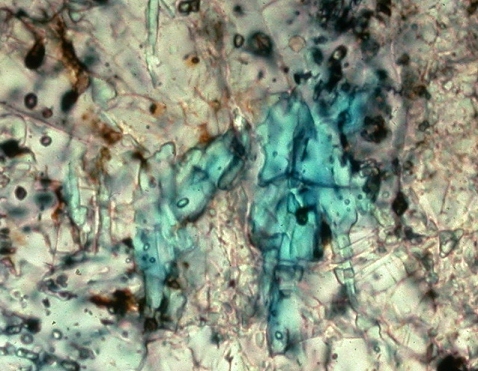 In some minerals such as kyanite and sapphire, both the Fe2+ - Fe3+ and Fe2+ - Ti4+ IVCT interactions occur.